I’ve been telling some acquaintances in Israel that one potentially positive effect of the concealed handgun carry law in Texas is that it might have made Texans a little more courteous behind the wheel of a car. OK, that’s open to debate. But you have to admit that you think twice about honking your horn at someone believing he or she could be packing a pistol, right? I know I have given it some thought. But in Israel, where automatic weapons often are seen slung over the shoulders of active-duty soldiers, horn-honking is a way of life. If you don’t move immediately after the light turns green, the driver behind you pounds on his horn. If you slow down on the street because you might be lost trying to navigate through a street-grid maze where a right-angle turn cannot be found, the same thing happens. Sometimes, it seems, people honk their horns just for the heck of it. Our Group Study Exchange team was warned about Israeli drivers before we got here. They’re aggressive, rude and impatient — and this assessment came from an Israeli professor at Texas Tech University. I’ve been considering whether to rent a car while I’m in Israel on vacation for a week when our GSE assignment concludes. To paraphrase Clint Eastwood in the film, “In the Line of Fire”: I might learn to love public transportation. I knew it would happen, but I’m still not sure I’ll be ready for the conclusion that is now just around the corner. Our Rotary Group Study Exchange trip began on May 10. We were midway through our first week in Israel and one of our team members, Fernando Valle, said, “I’ve been here less than a week, but already it feels like a month.” I recall saying something like, “Amen to that, brother.” But remember this, I cautioned: It’s going to fly by and when we get near the end, we won’t know what had happened to the time we have just spent. With eight days to go, the reverse of what we felt at the beginning is setting in. At least for me, it is. I’m going to take an extra week of vacation when my wife arrives at the end of our GSE assignment. I will enjoy tremendously showing her a taste of what we will have seen. But most of our team is going home on June 7. Saying “so long” to them will be difficult. This journey to date has been one for the books. It looks for all the world, though, like the final chapter is going to be a doozy. A friend in Amarillo cautioned me about traveling to Israel. Jerusalem is beautiful, she said. Tel Aviv is alive and vibrant, she added. But the desert? It’s barren, hostile and not very inviting. My friend, for whom I have great affection, is flat wrong. I’ve been traveling through Israel for nearly three weeks now with a Rotary Foundation Group Study Exchange team from West Texas. Our journey began May 10 in the desert. 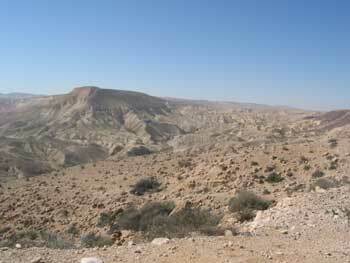 I am not sure what my friend failed to see in the Negev region of southern Israel. I do know what I saw: splendor beyond belief. You drive south from Be’er Sheva to Eilat. The only vegetation you see are the scrub trees planted by settlers in isolated villages along the way. The rest of it? Sand and rock. But it is magnificent. There is no need to qualify it with it being “beautiful in its own way.” No, this place is splendid in its beauty. Perhaps you’ve been checked on your way out of a Westgate Mall department store by some guy looking for a receipt to prove you bought the merchandise you’re carrying with you. In Israel, though, mall security takes on a different meaning. We went to the mall Tuesday night in Haifa for a quick bite to eat. My host, a Rotarian who came to Israel from South Africa nearly 50 years ago, parked his car underground and we walked to the mall entrance. We were met by a security guard standing next to a metal detector. I emptied my pockets and walked through. OK, no problem. I was told about this in advance. Terrorists have blown up shopping malls in Israel. So, the Israelis take no chances. The guard even had one of those wands they use — just in case they sense something suspicious. What if I were carrying a gun? My host said I’d better produce a license to prove I was allowed to be packing heat — or else. He didn’t say what the “or else” would entail. We received a heads up today. The Israelis need to stay alert to any eventuality. Heaven knows they get enough surprises in their lives, with rockets and mortars fired into their cities from time to time across some quite hostile borders. They’re going to have a drill next Wednesday. Sirens all across the country will wail. Stores will lock down. Business will stop. The sirens are meant to test Israelis’ quickness to respond. There’s no telling how quickly everyone will need to run into the bomb shelters. My hosts, a Rotary couple in Haifa, tell me the sirens aren’t the same as the “real thing.” But it’s a drill, and it’s supposed to be realistic enough to make them go through the motions. I’ll be curious to know whether the country responds more quickly to than many private businesses do in the States when a routine fire drill occurs. I’m guessing the Israelis are pretty good at this. I was pinching myself Sunday night because for a moment, I couldn’t believe I was doing what I was doing. Our Rotary Group Study Exchange team met with a combined group of Rotary clubs under a Bedouin tent … in an Arab village … in an Israeli city … far from home. Our presentation went off without a hitch; well, maybe one — we’ve had some audio trouble with one portion of it, but we’ve learned how to improvise. It’s the same one we’ve been presenting ever since we arrived in Israel on May 10. We’re getting pretty good at this. Our team — Katt Krause of Amarillo, Aida Almaraz of Amarillo, Shirley Davis of Levelland and Fernando Valle of Lubbock — tells our hosts a little about themselves, their occupations and their families. They sprinkle their presentation with just the right amount of West Texas color, which our hosts appreciate very much. We’ve also been blessed to be traveling with an engaging team from The Netherlands, who are conducting a simultaneous exchange right along with us. So, this GSE team is getting a double dose of cultural exposure — from our hosts as well as from our traveling companions. But this event Sunday night was quite special. We had Jews and Muslims and Christians sitting under the same tent, eating a wonderful assortment of food prepared by our hosts living near Karmiel. Many of the folks were familiar, as we had met them the previous day. The first two weeks have rocketed by, as I look back on it. The next two likely will fly past us even more quickly. Everyone keeps telling us the same thing: Wait until you get to Jerusalem. Jerusalem is our final stop. We’ll deliver our final presentations to the Rotary District 2490 conference before a crowd predicted by our hosts to exceed 600 people — by far the largest room we’ll “play” on our journey. With all due respect to The Beatles (who helped raise me during the ’60s), the “Magical Mystery Tour” had nothing on this adventure. Our Rotary Group Study Exchange team was strolling through the old market place in Nazareth, Israel the other day. Fernando Valle, a team member from Lubbock, was asked by an elderly gentleman, “Where are you from?” Fernando responded, “The United States.” “Where in the States?” the man asked. “Texas,” Fernando answered. “Ah, Texas,” the man said, smiling. He then began twirling his hands, as if to be spinning six-shooters around his trigger finger. Therein lies the prevailing image that Texas — and Texans — seem to have in the Middle East. We’re all a bunch of gun-slingers. It’s not entirely clear to me whether rank-and-file Israelis believe that about Texans and our state, or if they’re just speaking to the stereotype just to get a rise out of us. We laugh it off — and continue to have the time of our lives. I grew up in the Greek Orthodox Church. I was baptized in my hometown as an infant. The church to this day is the center of a communitywide festival in Portland, Ore. It’s become a huge event. But I moved away from the church as I became a teenager. Then I married the girl of my dreams in 1971 in a Presbyterian ceremony — and became a Presbyterian. Sitting in Greek Orthodox sanctuaries in Nazareth, Israel, was one of the most personally moving moments of my trip through the Holy Land. Nazareth is now a mostly Muslim community, but it certainly honors its long-standing Christian tradition. The Church of the Annunciation is where Christian believe the angel Gabriel informed Mary that she would be the earthly mother to the Son of God. It is a beautiful church building in the middle of the old part of the city. Nazareth is not far from the Jordan River, or from Galilee. But I so truly enjoyed sitting in these Orthodox sanctuaries, taking in the sight of the icons and the depictions of Jesus and Mary, and the apostles. I even could smell a bit of the incense, very similar to the aromas of the church I attended in Portland all those years ago. For the first time on this extraordinary visit to this equally extraordinary place, I felt at home. Bigger in Texas? Boy, howdy! As our Group Study Exchange team has coursed its way through Israel, we’ve been giving presentations about ourselves, our professions and our communities. The one element of our presentation that almost always gets a rise out of our Rotary Club hosts deals with an item of food: a Texas steak. Katt Krause, one of our team members, reminds our hosts of the saying that “everything’s bigger in Texas,” and to illustrate the point, she talks about the Big Texan Steak Ranch, and the monstrous 72-ounce steak one gets for free if he or she can choke it down in an hour — or less. You have to eat the steak, plus all the sides, she says. Of course, when she converts the ounces to pounds, and then back to kilograms (it’s about 2 kilos), then our audience members’ eyes really light up. And this occurs is in a country that, based on our experience during the past two weeks, seems to thrive on the consumption of food — and lots of it. Isn’t that how the state promotes itself? Well, our Rotary hosts in Israel seem to think we’re on a par with at least one other nation. Our Group Study Exchange team has been introduced from Nahariya to Eilat as the “team from Texas,” while our traveling companions from the Netherlands have carried the national banner of that western European nation. We’re proud of the designation, and to be frank, we haven’t dissuaded our hosts from using it as we present ourselves to them. So much of our PowerPoint presentation talks of Texas tradition: big steaks, rodeos, cattle and oh yes, football (American style, of course). Since Rotary International doesn’t want us talking politics or religion during this exchange, I keep my mouth shut over the recent dust-up regarding Gov. Perry’s remarks dealing with whether Texas should secede from the Union. We won’t go there — you know? But that’s all right. For now, we’ll carry the Texas banner high and with great pride. And we’ll let our hosts continue to portray us as a “whole other country” — which, of course, at one time would have been entirely accurate.